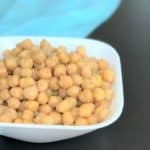 Home » Recipes » Instant Pot Cooking Basics » How to cook Chickpeas in Instant Pot? Try cooking Chickpeas / Garbanzo beans in the pressure cooker or instant pot. They are quick and hands free. And guess what, you don’t have to use the high-sodium canned chickpeas anymore. While doing that, also save on some money…honey! I grew up in India, where growing up I had never seen a can of chickpeas. I know, surprising…right? But in Indian everyone just uses their pressure cooker (stovetop) to cook chickpeas from dried one’s. They are cheaper and healthier. Then I came to Chicago for work and realized the abundance of canned products. At first, it seemed exciting that I could use a can of chickpeas and not have to wait to boil them. But then, I started reading nutrition labels and realized the downside of the cans. Quickly, I moved back to the traditional methods. And so will you, after realizing how easy it is to cook chickpeas in an instant pot. Make this perfectly cooked chickpeas, store them in the refrigerator for upto a week or freeze them in small batches. So you have them handy for any recipe that calls for chickpeas. I like to make salads with these chickpeas. Another great way to use these chickpeas is in a pulao or biryani. You add protein with the rice and add some veggies to make it a complete meal. Or make hummus…Yum! 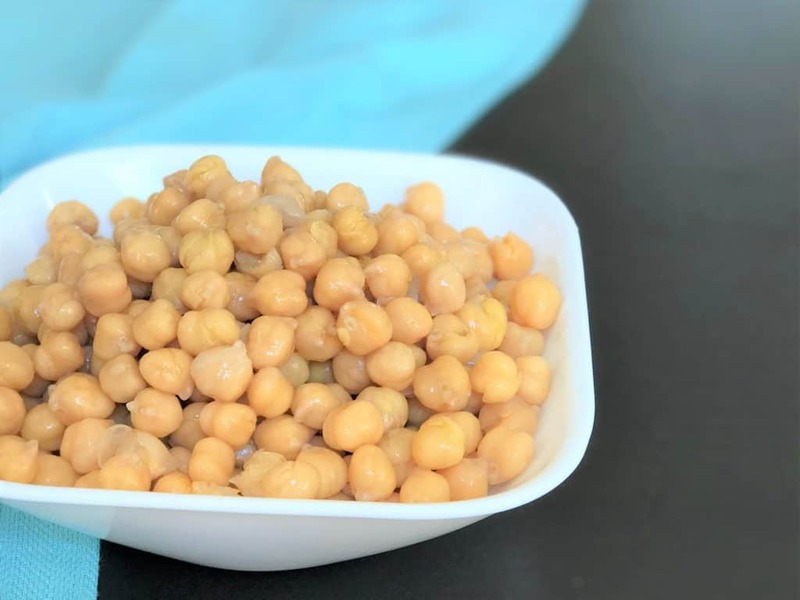 Chickpeas are a popular legume across nearly every continent, which not surprising looking at the benefits and nutritional content of chickpeas. 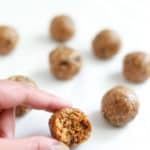 They are a powerhouse of nutrients, packed with plant-based protein, dietary fiber, and carbohydrates. One cup of boiled chickpeas has 269 calories, with 45 grams of carbohydrates, 4.5 grams protein and a whopping 12.5 grams of fiber. You can either soak the chickpeas or just cook them right away. However the difference is how long they take to cook. Unsoaked chickpeas take about 40 minutes to cook under pressure, while soaked chickpeas take 20 minutes. As you can see, there is a significant time difference. I prefer to soak the chickpeas and reduce the cooking time (save some electricity too!). I also like to add some salt when cooking chickpeas, that is totally optional. This also means I reduce the salt used in the dish that I prepare with the cooked chickpeas. Optionally, you can also add garlic and/or bay leaves when cooking. 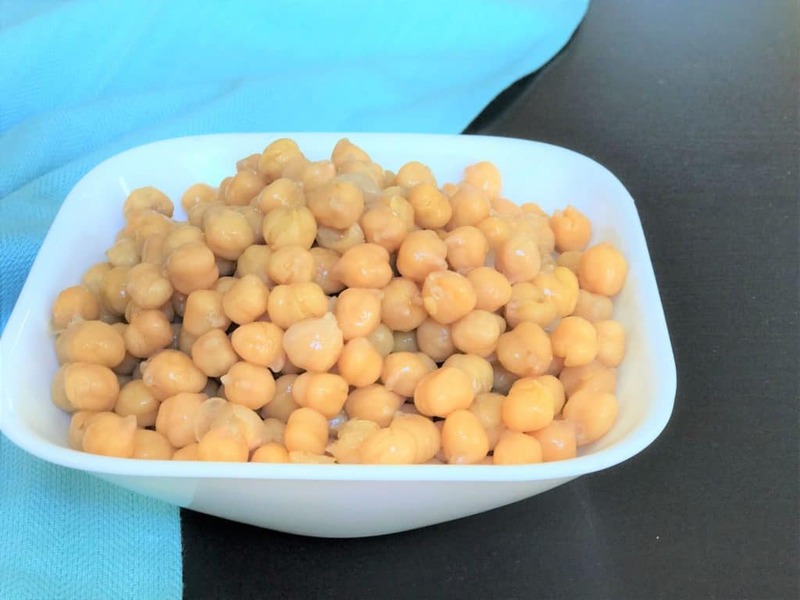 I cooked these chickpeas in an instant pot, but you can use any pressure cooker. Just add the chickpeas and water to the pressure cooker and set it to cook at high pressure for the required time. I use a 1:3 chickpea to water ratio. Enjoy the chickpeas in a salad or pilaf or in your favorite hummus. If you are looking for more chickpea recipes, check out Chana Masala made in the pressure cooker. Some readers asked about Black Chickpeas, here is the recipe for Kala Chana Curry. 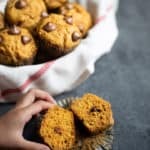 Check out other instant pot basics recipes – Amazing Steamed Broccoli, Pumpkin Puree, No-boil Yogurt and Cooking Beets in the Instant Pot. 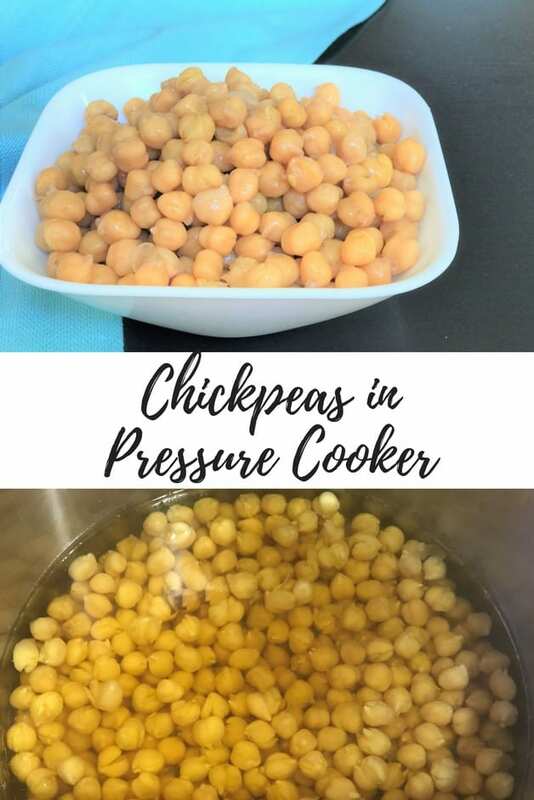 Easy and healthy Chickpeas cooked in a pressure cooker. Better than canned and quick to make. Enjoy in a salad or pilaf or hummus. Rinse the chickpeas in ample water using a colander. 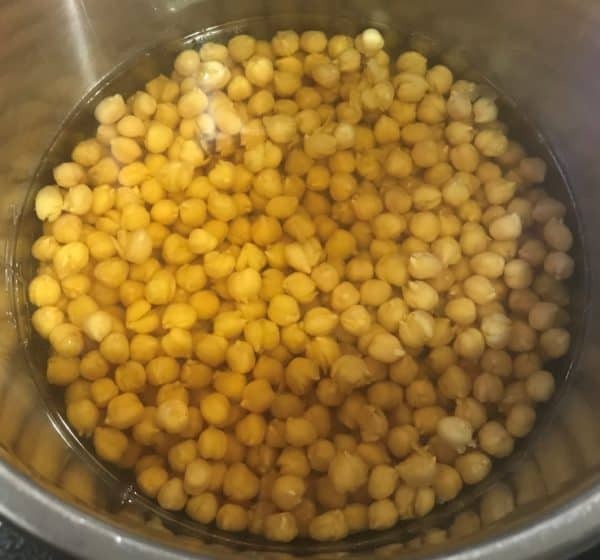 Add the chickpeas along with the water to the instant pot insert. Add salt (optional). Close the lid with vent in sealing position. When the cooking time is up, turn off the Instant Pot and do a 10 minute NPR, which means release the pressure manually 10 minutes after the beep. 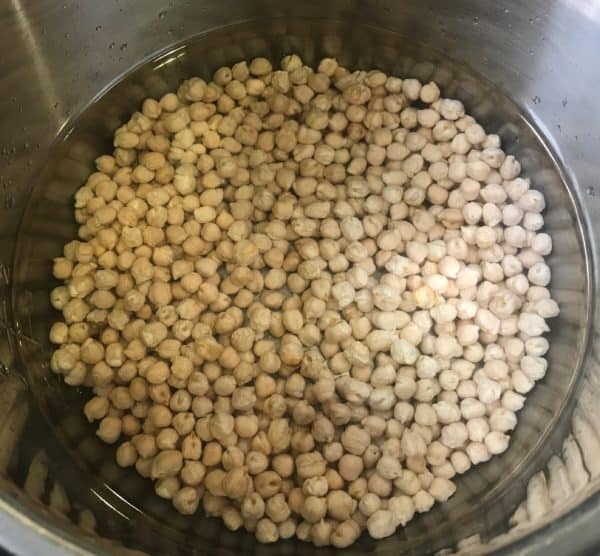 Strain the liquid and refrigerate or freeze the chickpeas in small batches. The cooking time can vary depending on the quality of the chickpeas. This time has worked best for me in the many times I have cooked chickpeas. In general, cooking time does not change if you half or double this recipe. Optionally you can add garlic and bay leaves which cooking chickpeas. The flavor of these is so much better than canned chickpeas. I added the bay leaf. What a difference. I’ll never go back to canned! 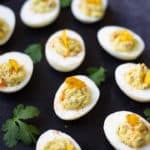 Hi I love all your recipes. I’m just trying to cook chole with preboiled Chana . 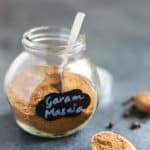 Can I preboil Chana based on this recipe in instant pot and use that Chana for preparing with gravy on stove top? 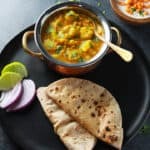 Hey Harini – Yes, you can cook chana using this recipe. Then mix it with the gravy on stovetop. I would recommend to let it simmer for 10-15 mins with the gravy, so the flavors get infused well. What about the darker ( kaale) Chaney? Same time??? How long do you cook the chick peas if you are looking to make 2 cups? Hi Reema – The cooking time does not change even if you half or double the quantity. The instant pot will just take less or more time accordingly to come to pressure and release pressure. I just want to let you know how much I love your recipe for chickpeas, especially your suggestion to add garlic and bay leaves! So flaverful!!! Thank you so much!! Hey Robin – Happy to hear you liked the chickpeas. I love the flavor of garlic (in anything :-)). Thank you for sharing your review! If I’m adding these to stew, can I add them in still dry, and make sure that the stew cooks for 40 minutes at high pressure? Would probably be adding a handful of these, and a handful of red lentils to my standard stew. Hey Danny – Yes, you can do that. If there lots of tomatoes in the stew, then cook for 45-50 minutes. I hope you enjoy the stew. Hi Meeta, I just discovered the Instant Pot, your blog, and am new to Indian food. I had no idea how much I would love the exotic flavors! I am enjoying your recipes very much. I followed your instructions for chickpeas in the Instant Pot and they turned out great. Thank you so much! If the outer layers are peeling off, did I overcook? No, they are perfectly fine. This happens at times. If you prefer a firmer texture, you can reduce cooking time a bit. Cooking chickpeas depends a lot on the quality of chickpeas. Hope you enjoy them! Thanks for the info and recipe! These came out perfect! Thank you! Great to hear! Thanks for sharing back your review.